I'm Larissa LoGelfo, a Texas based artist and sculptor. 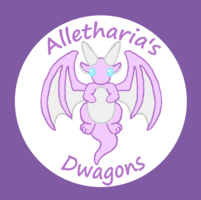 Alletharia's Dwagons has all the cute dragons! From adorable resin figures and necklaces, to buttons and stickers of all your favorites! Find the perfect gift for any dragon lover!